Developing a product is a process of design versus construction. As most of us experience at some point, the best laid designs rarely go as planned. Some mistakes are easily corrected while others can ruin materials completely. The original Triode design, though very compact, makes for a smaller margin of error and potentially more mistakes while assembling the unit. The picture shown here was an attempt at moving it over to the larger 1590BB enclosure which will most likely be a standard until I can finally do away with drilling by hand. This item is fully functional. The main problem with the enclosure is that the bottom two knobs are a few millimeters closer together than they should be. Thus, there’s no point in painting the enclosure and can be purchased at a highly discounted price! $11.00 flat rate shipping to continental U.S. only. International orders will be billed the difference before item ships. This little guy is a cigar box turned amplifier for guitar practice or MP3 player. The idea behind this amp was to get a classic sound from a classic looking enclosure while re-using existing materials. This cigar box hails all the way from Nicaragua, and it’s wooden resonance gives it a beautiful, natural sound. The amplifier can be powered off a 9V battery or with a 9VDC power adapter. It has a volume knob and tone contour knob to set balance bass and mid tones. With a 1/4″ Switchcraft stereo input jack, an 1/8″ TRS adapter (not included) can give your MP3 player or phone the nostalgia of a 1960’s transistor radio. It’s a great looking addition to your shelves or coffee table while its portability lets you take it with you to the beach or picnic. Here’s a demo of a previous build featuring Alex Wilson of Supersun. Results may vary. Alex Wilson of SONCATS as he demos an LM386-based cigar-box amp… from abram on Vimeo. Only one in stock currently. Ships in 1-3 business days. Amplifier re-appropriation as we do it. This was a Fender Frontman 15B (solid-state bass amp) turned 5W SE tube amplifier. Solid-state rectifier with a 12AT7 pre-amp, FMV tone stack, and and EL84 power-amp section. If you’ve got something you’d like to re-appropriated, get in touch. Visit the Little Rock Children’s Library and Learning Center to sign-up for the class. We’ll be building square-wave oscillators and having a short orchestral concert. Based on the Mitsumin Valvecaster circuit, this simple design is a 12AU7 preamp running on a mere 9V DC. I’ve found this thing to be useful for guitar, synth, and samplers giving a warm, lively edge to any small signal. It features Volume, Tone, and Gain controls. High gain results in a warm vacuum tube break-up while lower gain provide sonic color and texture. Here are two audio samples of the triode. The first is made with two synthesizers (a Korg DW-6000 and a Novation Xiosynth) while the second is for guitar (a Johnson Telecopy). The first is recorded direct with no signal processing added except for a 6dB signal boost in the clean signal of the last set. The guitar samples were recorded on a Tascam DR-07 with a Bulgera 333 amp. Each section features a clean section followed by an effected section and so on. Each effected section adds more gain and volume each time through starting in the middle ranges and increasing to higher range. Maximum tone roll-off is demonstrated on the second variation of both demos. This reverb stomp-box is based around the Belton Digilog reverb modules with a MOSFET driver circuit and JFET recovery. Separate Dry and Wet controls allow for a wide variety of saturation control. 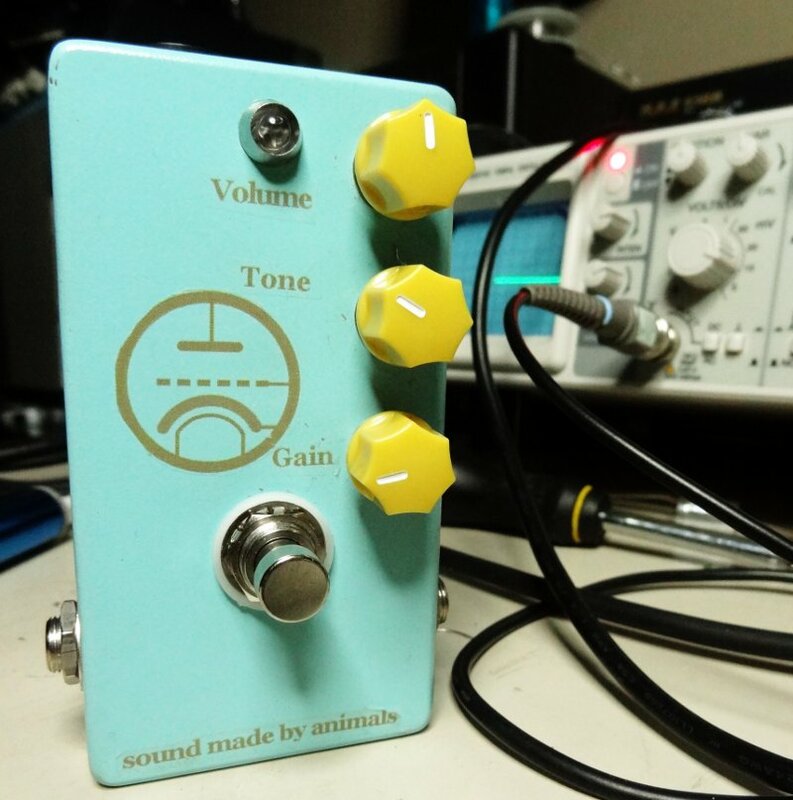 Toggle switch activates a pair of Germanium clipping diodes for a “dirty” reverb sound.